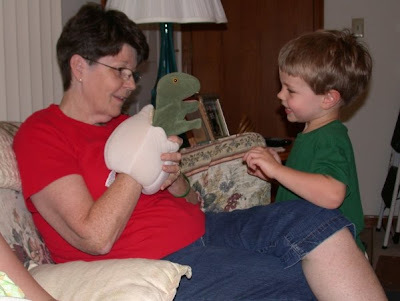 During our visit with Aunt Judy and Uncle Bill, Aunt Judy did the "puppet thing" for the kids. A baby dinosaur hatched from its egg. Sam was so funny. He was startled at first by her green turtle puppet, but soon it became his friend. Judy has quite a collection of wonderful puppets and she is so masterful in bringing them to life. 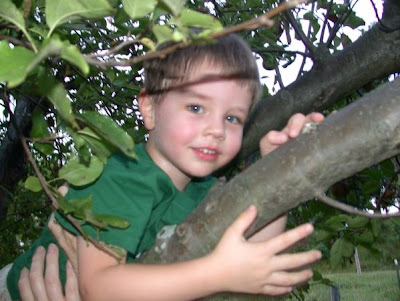 Sam decided it was time to climb his first tree. 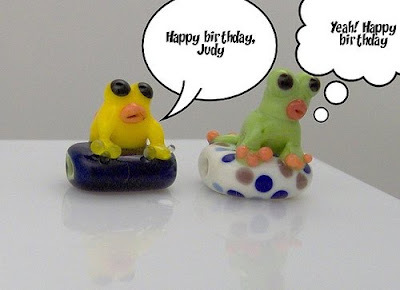 (Well, Aunt Judy and Mom Sarah decided!) He did need some assistance from the tree pushers. Success! The apple tree has been conquered. The photo below is a favorite. 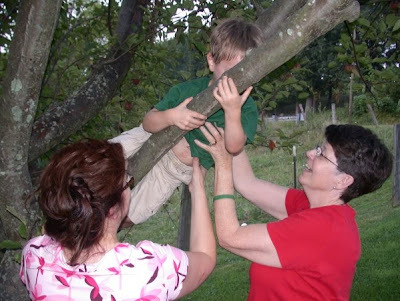 Grandma and Nate are sizing up this climbing adventure. 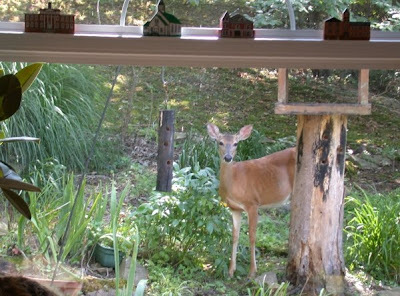 The porch is an excellent viewing area. Nate is not certain why big brother is up a tree. 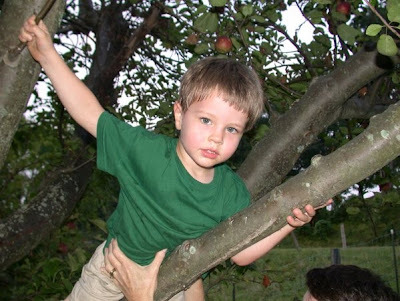 It will only be a few more years when Nathaniel James will be doing the climbing. Sam ran around the house about five times. We would say "Start your engines. Get ready, set, and GO"! He giggled throughout his run. When he came back to the starting line, we would clap and yell for him. Man, he was a tired puppy, but still continued his race. After he finished, he was so hot. 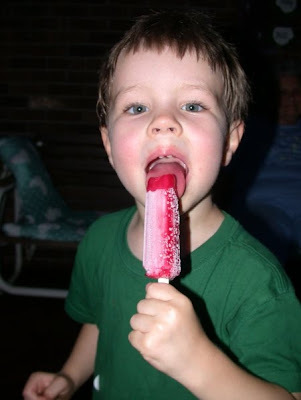 A popcicle was a necessity. What a great time we had visiting family! On Wednesday,we met Grandma Great Meads, Sarah, Nate, and Sam at Uncle Bill and Judy's house that is located a few miles from Spencer. Jeff had a dermatology meeting in White Sulphur Springs at the Greenbrier so he was not able to be here to enjoy this family time. What a fun time with family! We all visited with Bill and sister Judy until Judy and I had to leave for the doctor's appointments in Charleston on Friday. Sarah and the boys left the following day. a wash tub almost works as well. 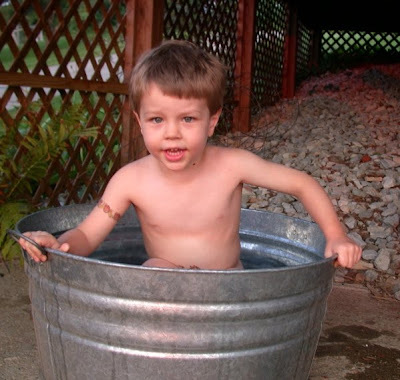 Sam enjoyed the splashing and waves that he made in the tub. We even had to go to the marina (WalMart!) to pick up a Fisher Price boat. 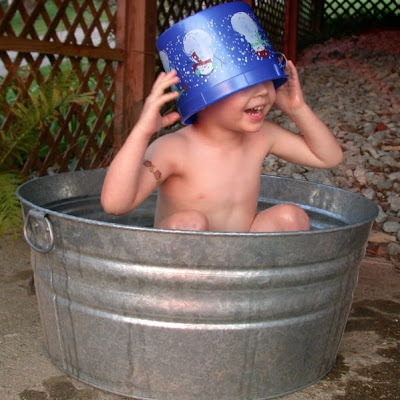 A boat is nice, but a bucket may be even better when a guy is playing in the wash tub. Sam also figured that a captain's hat was in order. 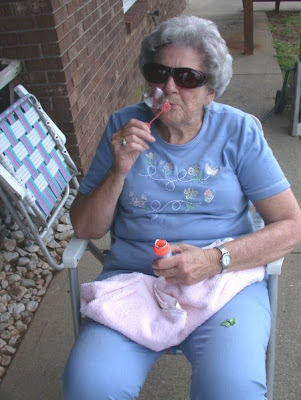 While Sam was into his water adventure, Grandma Great tried her skill at bubble blowing. 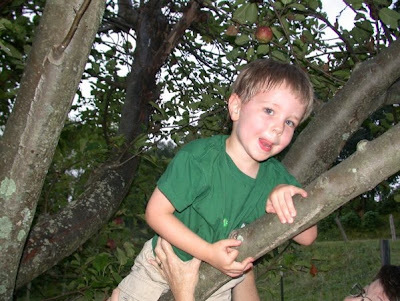 Tomorrow we will post a few more photos of our visit including Sam's first attempt at climbing a tree! Schools of newly-designed robotic fish could one day patrol waterways, swimming around as fluidly as the real fish they're based on, looking for environmental pollutants and inspecting submerged structures, such as boats and oil pipelines. Mechanical engineers Kamal Youcef-Toumi and Pablo Valdivia Y Alvarado designed the sleek robotic fish to more easily maneuver into areas where traditional underwater autonomous vehicles can't go. "Given the (robotic) fish's robustness, it would be ideal as a long-term sensing and exploration unit. Several of these could be deployed, and even if only a small percentage make it back there wouldn't be a terrible capital loss due to their low cost," said Valdivia Y Alvarado, a recent MIT Ph.D. recipient. Check out the cip below! Let's see -- do Navy contracts and military applications sound familiar? 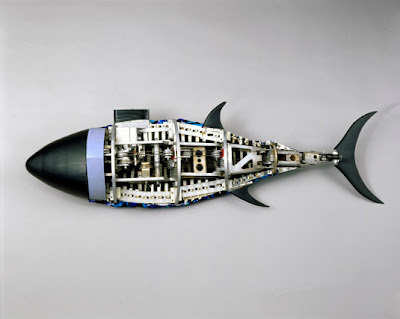 Robotic fish are not new: In 1994, MIT ocean engineers demonstrated Robotuna, a four-foot-long autonomous fish. But while Robotuna had 2,843 parts controlled by six motors, the new robotic fish, each less than a foot long, are powered by a single motor and are made of fewer than 10 individual components, including a flexible, compliant body that houses all components and protects them from the environment. The motor, placed in the fish's midsection, initiates a wave that undulates along the fish's flexible, continuous body, which is how real fish propel themselves through the water. Researchers have also mechanically mimicked bats, bugs, snakes, and of course, humans. The MIT team's first robotic fish prototypes, about five inches long, mimic the carangiform swimming technique used by bass and trout. Most of the movement takes place in the tail end of the body. Fish that use this type of motion are generally fast swimmers, with moderate maneuverability. Later versions of the robo-fish, about eight inches long, swim like tuna, which are adapted for even higher swimming speeds and long distances. In tuna, motion is concentrated in the tail and the peduncle region (where the tail attaches to the body). Real fish are exquisitely adapted to moving through their watery environment, and can swim as fast as 10 times their body length per second. So far, the MIT researchers have gotten their prototypes close to one body length per second — much slower than their natural counterparts but faster than earlier generations of robotic fish. Let's Blow Up a Whale! Calm down my PETA friends! It is not what it seems. A plastic whale now looms before you. (OK, now I've offended some of my friends protecting the enviroment from the scourges of plastic!) This posting is dedicated to the tale (or tail) of a whale. Oh, what good memories! 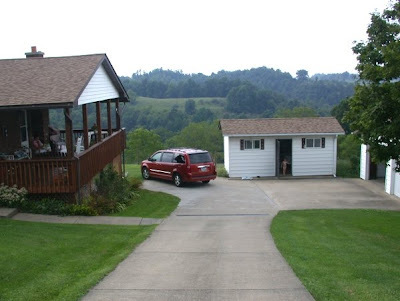 I was a member of the West Virginia CATS project team (Coordinated and Thematic Science) along with the Project WILD and Project WET programs sponsored by the WV Department of Natural Resources. It was an exciting time because we were developing hands-on activities in science for WV public school students. What great science teachers we have in our state! One of the special exhibits involved the construction of a full scale blue whale (our was really black due to necessity) using plastic trash bags. The photo above is similar to our whale. The whale was inflated by a fan that allowed the students to enter the "belly" of the model. I was checking out the news and came across this recent video posted of an origami whale that was constructed at a special dinosaur exhibit in Tokyo. Twas an origami Spinosaurus! Spinosaurus (meaning "spine lizard") is a genus of theropod dinosaur which lived in what is now North Africa, sometime during the Albian and Cenomanian stages of the Cretaceous period, about 112 to 93.5 million years ago. This genus was first known from Egyptian remains discovered in the 1910s and described by German paleontologist Ernst Stromer. These original remains were destroyed in World War II, but additional skull material has come to light in recent years. Our friend Tranosaurus is the beast below outlined in blue. The Spinosaurus is the largest outline shaded in red. Click below on the video to make the paper Spinosaurus come to life! OK! I know I have a weird sense of humor! Yes, I am 2/3 finished with the series of 12 chemotheraphy infusions. I did great again today. We have four more to go. 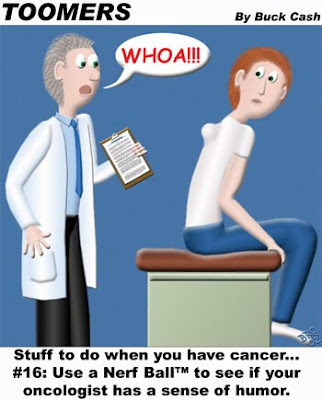 A PET scan will be in order 2-3 months after the last infusion in October. 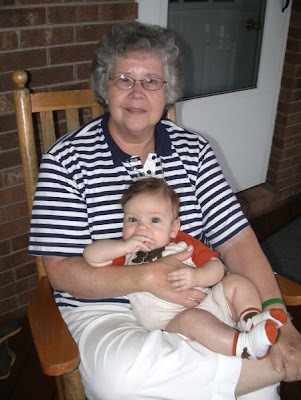 Mis Paula at the Cancer Center could not locate the ABVD process that was posted on July 17th, 2009. Twas a Friday. To help Paula (who is the lovely lady at the check-in area and always brings joy to my heart when she smiles) , I suggest clicking on http://jimmeads.blogspot.com/2009_07_01_archive.html. 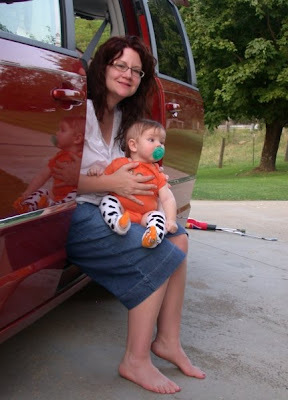 then scroll down to the July 17th blog entry. scoll down to the May 21, 2009. Thanks once again to my infusion nurses, Dr. Craig, and all my friends and family for your continued support, care, and love! Pacu is a common name used to refer to several species of South American freshwater fish that are related to the piranha, which are also kept as pets in aquaria. They are popularly thought of as herbivorous. Their teeth, which may look similar to human teeth, are used to cut through vegetation and crush seeds that fall into the water. Pacu and piranha have similar teeth, although the difference is jaw alignments; piranha have pointed, razor-sharp teeth in a pronounced underbite, whereas pacu have squarer, straighter teeth in a less severe underbite, or a slight overbite. 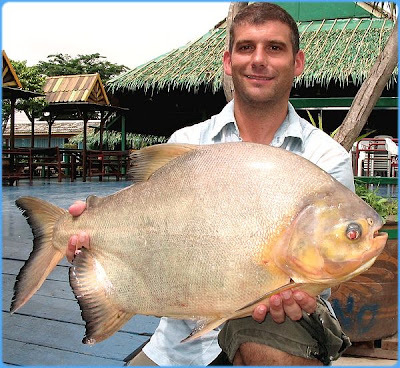 Additionally, full-grown pacu are much larger than piranha, reaching up to 30 kg (60 pounds) in weight, in the wild. Yesterday the lad below caught the exotic fish. I know that I purchased my fishing license and still havce not drown a worm! I am planning on going fishing with this lad. The purple pitcher plants introduced in the 1940s at Cranberry Glades Natural Area (Monongalhelia National Forest - Pocahontas County) are minatures compared to the new species discovered recently. 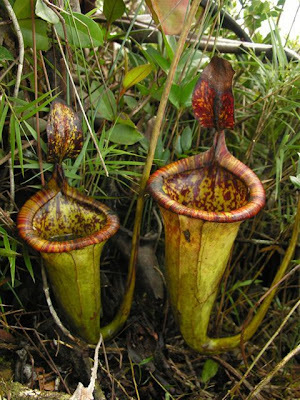 Rumors of the existence of hugh carnivorous plants began circulating back in 2000, when two Christian missionaries described seeing enormous pitcher plants while wandering lost on Mount Victoria in the central Philippine highlands. 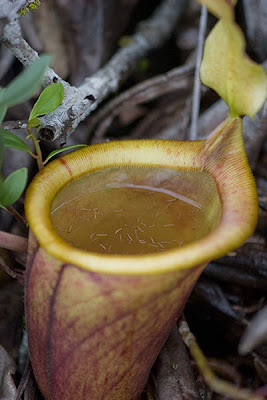 Sufficiently intrigued, a group of pitcher plant experts organised an expedition to this remote area and found an enormous plant with liquid traps large enough to drown a rat. The new species has been named Nepenthes attenboroughii, after the naturalist broadcaster David Attenborough. It is thought that only a few hundred of the plants exist, growing only on one mountain on the island of Palawan. It is likely that the new species occasionally digested rats and mice. Sir David Attenborough already has several species named after him, including a spiny anteater in New Guinea, a rare tree in Ecuador and a marine reptile, the Attenborosaurus, that lived during the Jurassic period. But he downplayed the scientific significance of such names. “You have to have names for things and and you run out after a bit,” he said. “It’s just a compliment, but it’s very nice to receive compliments." Yesterday morning I was busy collecting the recyclables for this morning’s pickup, when Judy came back from an appointment and said, “Jim, get your camera and come with me!” I was grumpy and replied, “Can I finish this job first? “NO, it will be too late!” I was a little miffed with all this drama. 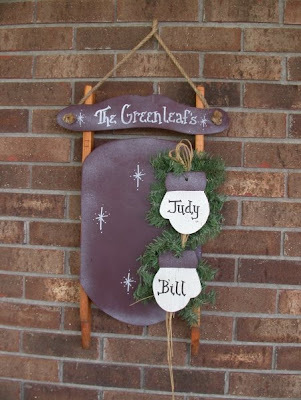 (As if I have never interjected drama into Judy’s life!) Oh well, Judy was just ready to open a new door in our life’s adventure. She said that you have to see this gentleman walking down the hill from the college. (I thought – she wants me to take a photo of a man walking down the hill?) 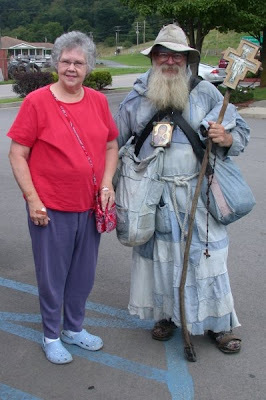 I then saw this fellow wearing a long blue patchwork robe walking with a staff bearing a cross on top. 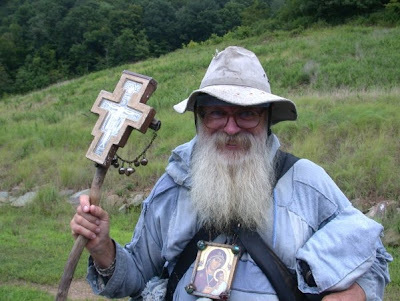 He had a flowing white beard and was wearing an icon of the Virgin Mary around his neck. We stopped and immediately his face radiated kindness. Judy said, “Could we treat you to breakfast?” “Sure, I am on my way to McDonalds!” he replied. I said “Could I take a photo?” “Of course” was his response. This was our introduction to Pilgrim George. 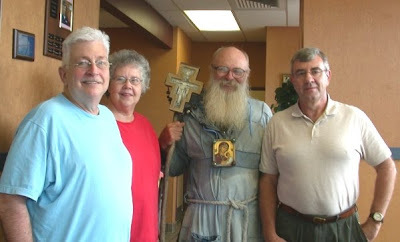 Pilgrim George (George Walter) is a Roman Catholic pilgrim who has walked 39, 000 miles for Jesus. His world wide walks have taken him on many adventures. 1970-71 was the year of Pilgrim’s first walk. In 39 years he has walked through forty countries. His robe is made from patches of denim that were collected from old jeans from those countries traveled. He recites the rosary in 20 languages and prays for the people in those countries. His icon around his neck is a copy of Our Lady of Perpetual Help, which, as he says, illustrates more of the divinity of Jesus rather than humanity. The original icon is under the care of the Redemptorist fathers of the Church of St. Alphonsus Liguori in Rome where it is now enshrined. His staff was cut at the cave of the prophet Elisha in Haifa, Israel, and it has been his companion throughout the Holy Land and many countries on several continents. When Pilgrim George finished Catholic seminary, he stated that he was an intellectual Christian but was lacking sincere faith in his heart. He was ordained as a deacon, but did not take his priestly vows. His spiritual quest led him to find the true meaning of the trinity. He rediscovered the meaning of God in the mountains of Colorado. He was in a desert in Spain and rediscovered Jesus while reading the gospel of Luke. Finally the trinity was completed in Pittsburgh when a Catholic charismatic group led him to find the meaning of the Holy Spirit. He is walking for Jesus. 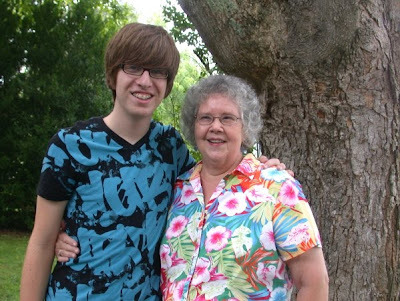 Pilgrim George explained that he had a calling that changed the direction of his life. 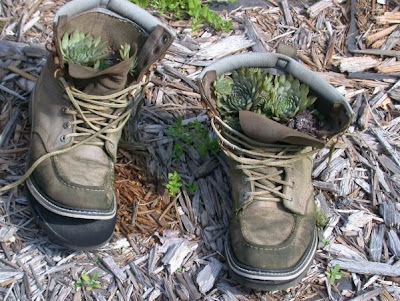 Just as Jesus said to his disciples to go on their walk and do not worry about money or worldly goods, Pilgrim George manages to travel with his worldly possessions in a denim patchwork duffle bag that contains his tent, bedroll, Bible, and many memories. He proudly showed us photos of him at the Vatican having an audience with Pope John Paul. I left Judy at McDonalds with our new found friend to go and see our State Farm family on Main Street. I requested a photocopy of the February 17, 2001 Pittsburgh Tribune article on Pilgrim George that he shared with us. I explained to friend, Dan Johnson, what had happened and that he needed to meet this pilgrim. Dan drove immediately to McDonalds where we continued our interesting conversations. 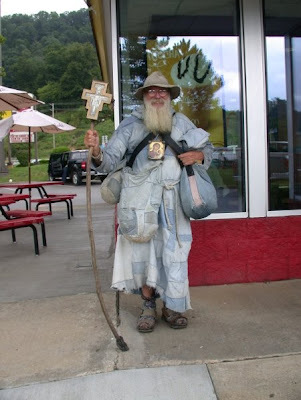 About an hour after first meeting Pilgrim George, he was off walking along Rt 119N to Lynn. His plan was to get to Weston by Saturday so he can attend Sunday mass at St. Patrick’s Catholic Church. He always plans his walks to assure that he celebrates mass every Sunday. Goodbye, Pilgrim George! We are much better since making your acquaintance! 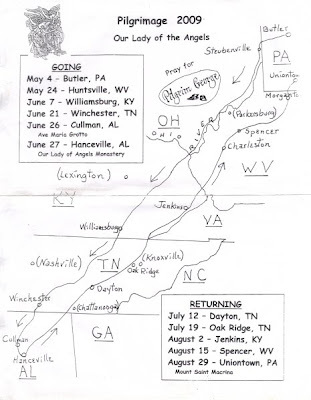 Here are a few links from the Pittsburgh Tribune that will provide more information on this traveling pilgrim. 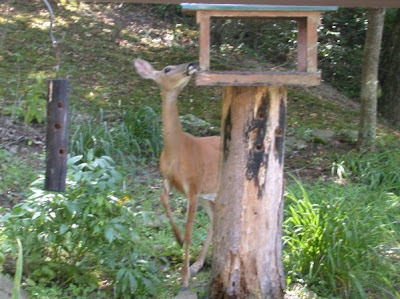 Yesterday afternoon the "deer birds" were back eating oil sunflower seeds out of our platform bird feeder. I should have cleaned the window as planned and these photos would have been sharper, but it has been so darn hot and humid these past days. 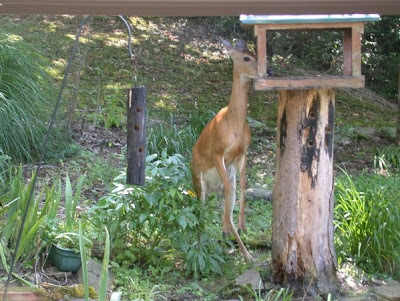 It does not take long for the ole deer to get the smell of the seeds. Up we go on the hind legs with the front legs daggling in midair. The tongue is indeed long and does a great job in collecting a quantity of fresh sunflower seeds into their gullet! 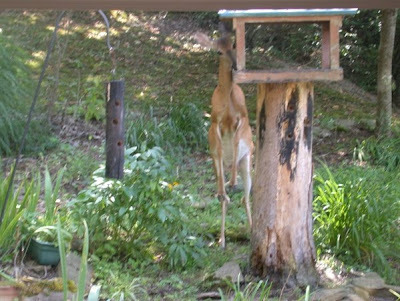 Our friend, Stan, took a picture of this strange critter that possesed a "forked tongue". I knew it had to be a larval stage of a butterfly (prolegs were present), but I could not remember which species. 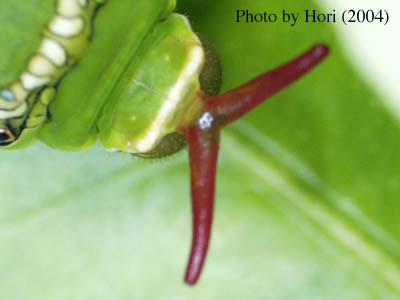 The "forked tongue" had to a horn, because all caterpillars have chewing mouth parts.) It turned out to be the larva of the Spicebush butterfly. The Spicebush Swallowtail butterfly is a large, dark swallowtail. It is one of our most beautiful and interesting swallowtails. All developmental stages are great examples of adaptive coloration. 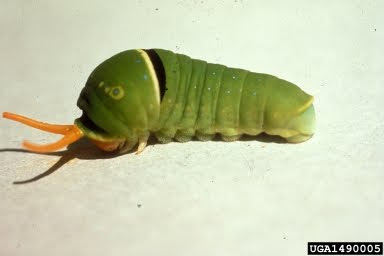 Swallowtail caterpillars vary in color and shape, depending on the species, but most have smooth skin, and some have long, tentactle-like projections. 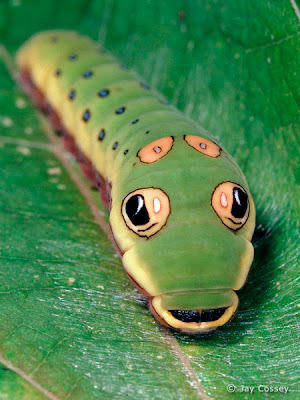 Swallowtail caterpillars are able to extend a brightly-colored, Y-shaped horn (called an "osmeterium") from behind their heads when they are disturbed. These horns are able to secrete foul-smelling defensive chemicals. Eggs are laid singly on the undersides of leaves of the host plants. Young trees are usually selected and eggs are typically laid from two to five meters above the ground. First instar larvae bend a leaf edge over and silk it down to make a leaf next. Older larvae spin a silk mat on a leaf that contracts to curl the two lateral leaf edges upward and together to form a leaf nest. Larvae usually hide in the leaf nest during the daytime and to molt when birds and other predators are unlikely to see them. They come out to feed at night. Young larvae are bird-dropping mimics, and mature larvae with their swollen thorax and eyespots are believed to mimic either green snakes or tree frogs. Larvae pupate on slender stems among vegetation, and pupae of the late summer or fall generation hibernate. Pupae may be either green or brown during the summer, but over-wintering pupae are brown. Both are leaf mimics. 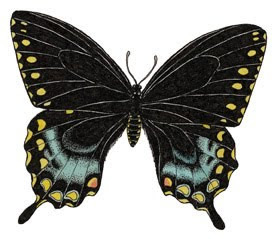 Adults are believed to be Batesian (palatable) mimics of the poisonous blue swallowtail. 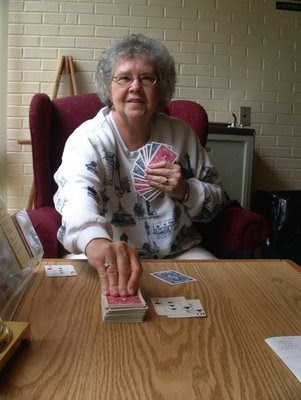 Yes, my good wife (who is beating me in canasta) is having a milestone birthday this day. I dare not give you her age, but here is a hint! Patricia Jane Hammonds Meads was born in Los Angeles, California. Her parents went to California to be in the movie industry. Cousin Nancy said that she has seen her grandfather in a silent film with Charlie Chaplin. One of the relatives died in his tutu when he was filming a wing walking scene on a biplane and lost his balance. 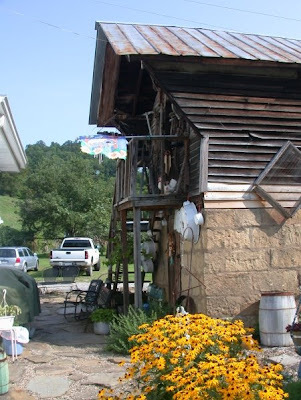 After her parents died, Aunt Patty was raised by her WV family on this historic farm at Pence Springs, just outside of Alderson. The house was built on an American Indian encampment. The folks have artifacts lining the wall in the sunroom. 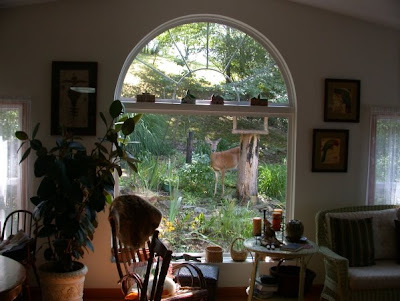 There are many arrowheads and other tools that were collected everytime they plowed the garden beside the house. The house is so interesting. We gathered here after Aunt Patty's service for a fine meal..
Below is a photo of the Meads crew. 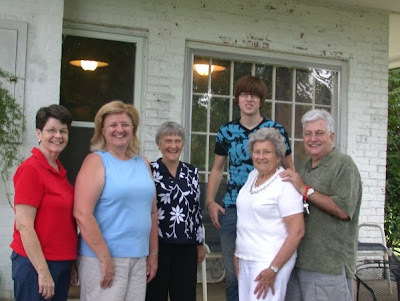 From left to right is sister Judy Greenleaf, Cousin Nancy Meads Spears (Husband Dorsey is taking the pictures along with wife Judy), Nancy Jeronic (curent owner of the house), Rob Spears, Grandma Great Meads, and the infamous moi! Rob and Judy share a love for the theater and the fine arts. I was not good at picture taking this day. I should have snapped photos of the other folks that shared a meal with us. 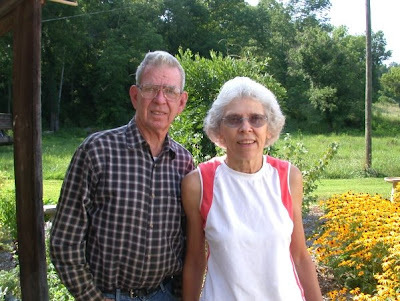 John Gwinn (93 years old and doing well) and Ruth Tolley Gwinn (also doing super at 90 years) are a part of the history of this area. Ruth taught people to fly at her airport in Pence Springs. She holds the distinction of being the youngest woman in West Virginia to obtain a pilot's license in 1937. Click below to see part of her interview in the PBS Documentary, The Long Runway Home. Ruth's husband had a distinguished military career and upon his retirement in 1964 was commissioned to construct the Greenbrier Valley Airport across form the Greenbrier. 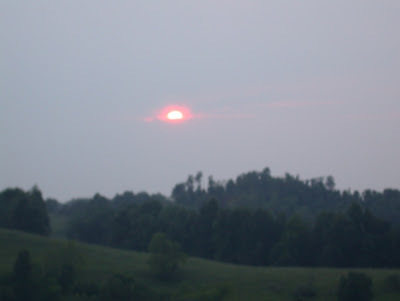 This has the longest runway in West Virginia - guess why? Does the Greenbrier Resort and it's BUNKER ring any bells? I mentioned yesterday on the blog that Ada Smith was a famous lady who was also born in Alderson, WV. Here is a brief synopsis of her story. Ada Beatruce Queen Victoria Louise Virginia Smith (1894-1984) was born in Alderson, West Virginia, the youngest of four children. When her father died, her family relocated to Chicago. It was there that saloon life caught her fancy, and where she acquired her nickname, 'Bricktop,' for her flaming red hair and freckles. She began performing when she was very young, and by sixteen, she was touring with TOBA (Theatre Owners' Booking Association) and on the Pantages vaudeville circuit. At age twenty, her performance tours brought her to New York City. While at Barron's Exclusive Club, a nightspot in Harlem, she put in a good word for a band called Elmer Snowden's Washingtonians, and the club booked them. One of its members was Duke Ellington. Her first meeting with Cole Porter is related in her obituary in the Huntington (West Virginia) Herald-Dispatch: Porter once walked into the cabaret and ordered a bottle of wine. 'Little girl, can you do the Charleston?' he asked. Yes, she said. And when she demonstrated the new dance, he exclaimed, 'What legs! What legs!'" She frequently taught her patrons the dances known as The Charleston and the Blackbottom. She owned the famous Paris nightclub known as Chez Bricktop from 1924 to 1961 as well as clubs in Mexico City and Rome. 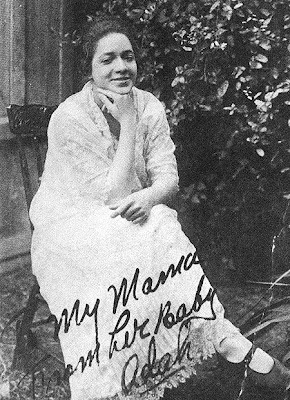 Her patrons included Cole Potter, the Duke and Duchess of Winsor, F. Scott Ftzgerald, Duke Ellington, Josephine Baker, and many others. Bricktop was know for her signature cigars. She died in her sleep in her apartment on New York's West Side in 1984. This past weekend we were in Alderson with sister Judy and Grandma Great Meads to attend my Aunt Patty's funeral. She was married to Uncle Sam (Dad's brother). 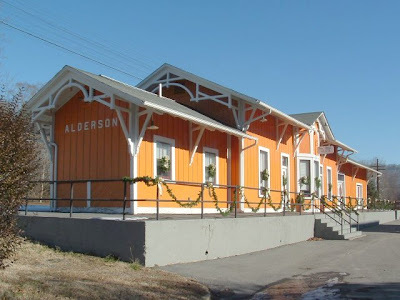 I was born in Alderson on October 12th, 1946 just across the railroad tracks from the historic railroad depot shown above. The depot is located in the center of town on the Monroe County side. The wonderful curved bridge is no longer used by vehicles, but is part of a city park. This walking bridge allows one to walk from Monroe County from Greenbrier County. 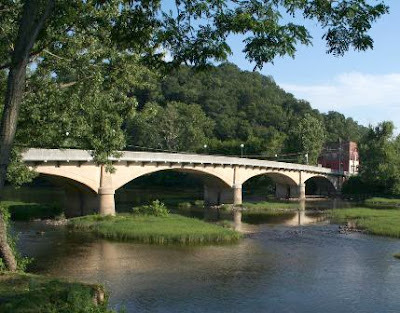 The Greenbrier River is the demarcation line for the two counties. The Greenbrier River is a wonderfully picturesque waterway. As mentioned, I was born on the Monroe County side of Alderson. My birth certificate indicates I was born in Greenbrier County! The doctor was probably drinking the Alderson "white lightning" at the time of my arrival! I know I have his forceps marks still obvious on my head. 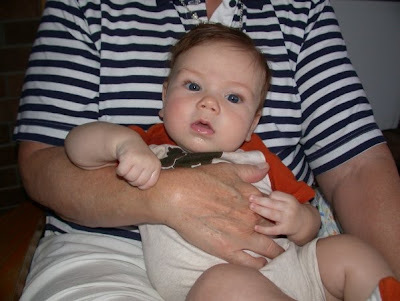 I was born at home and Grandma Great had a hard time during my delivery. After the service, we had a great visit with Cousin Nancy and her family. By the way, Alderson was the birthplace of Ada Beatrice Queen Victoria Louise Virginia Smith. A really famous lady that gets little attention these days. Will tell thee more tomorrow of this lady! 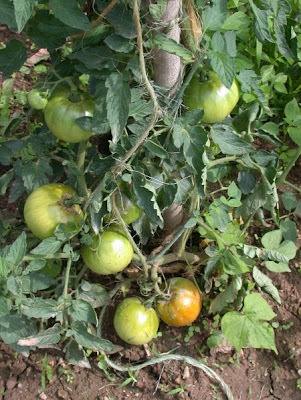 Yesterday I received a call from Lambert Fitzwater saying that he had some tomatoes and squash for us. 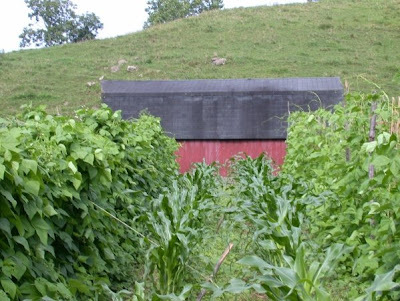 I went out to their farm which is located along Route 5 west of town. 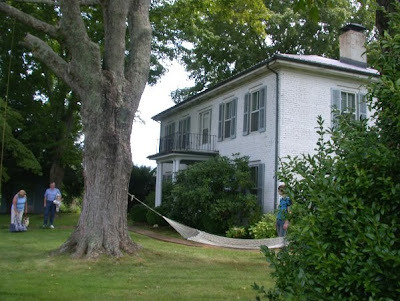 Lambert and Frances live in the historic Floyd-Moffett-Fitzwater House as seen above. 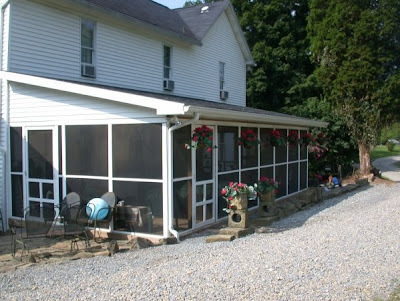 The folks added the large porch onto the house several years ago. It is a great meeting place. Here is a little history of the house. Thomas R. Floyd settled on the waters of the Little Kanawha River a few miles above Glenville in 1842 to build a log house on 1000 acres he acquired from the federal government. An early document gave Floyd permission to drill salt wells. 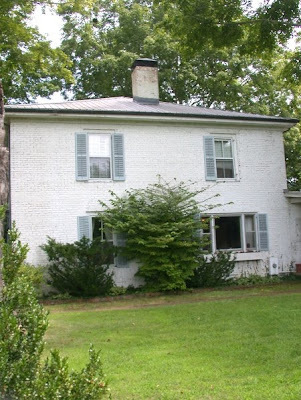 The current house was built in 1899, and has been owned by the Fitzwaters since 1992. Frances does an excellent job of tending her flowers. I love this old cellar house. What a treasure! 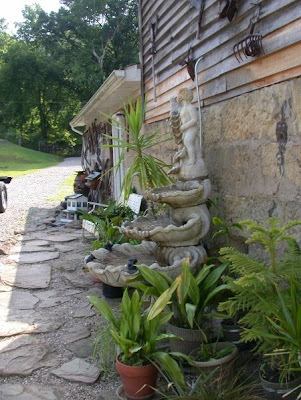 While Frances cultivates the flowers, Lambert grows a great garden. Here are a few shots of Frances's flowers and decorating skills. 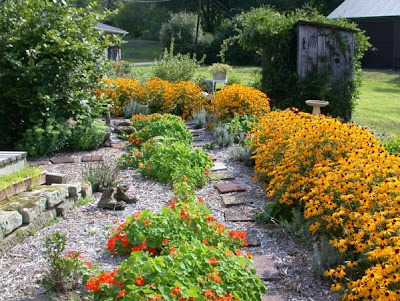 I can not say enough on how fine a garden these folks raise. Lambert works hard in his garden and he certainly knows how to produce fine produce! 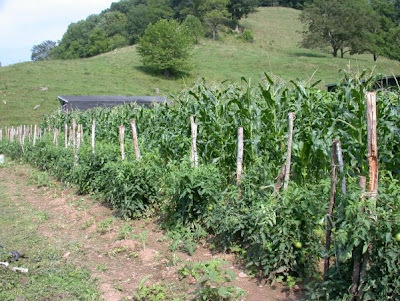 An example is the row of tomatoes in front of the ripening corn. The beans are exceptional. 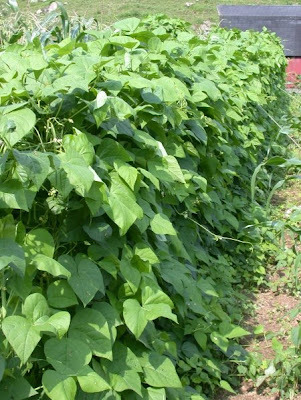 Lambert's skill in producing these legumes is amazing. 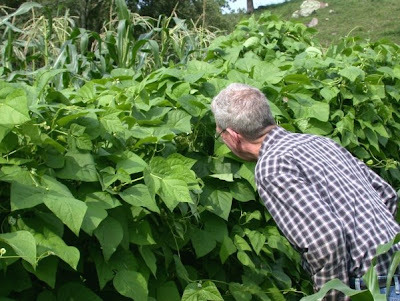 He knows the correct fertilizers and has a wonderful technique for supporting the vines. 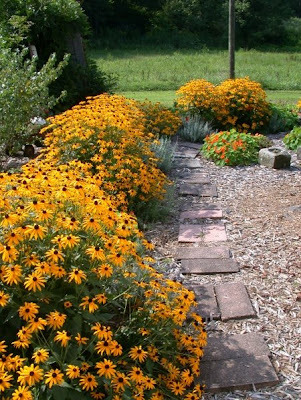 It is a great garden. Our hats go off to Lambert and Frances. Thanks for all the fresh produce!